Our Arthritis Joint Pain salve has been designed to help relieve the symptoms associated with arthritis, sore muscles and joints. A tiny bit goes a long way. Our salve uses organic ingredients and contains 250mg Full spectrum CBD oil with coconut oil, shea butter, beeswax, peppermint oil, ginger oil, cinnamon oil, thyme oil rosemary oil, clove oil, frankincense oil, eucalyptus oil, myrrh oil and capsaicin oil. Comes in a 2oz glass jar. This product has not been evaluated by the FDA and is not intended to treat or cure any disease. Please consult your physican before using. I have been a massage therapist for 29 years and used many muscle rubs, creams, and oils with my clients. 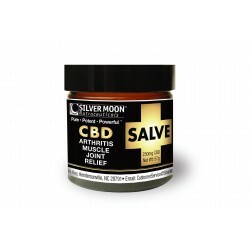 I have to say that Silver Moon Arthritis Joint Pain Salve is the best and most effective salve I have ever used. The base is healthy oils, the organic ingredients are high quality, - and it works. That it comes in glass (not plastic) is a nice bonus. I thank Silver Moon for creating a super high quality product and to price it affordable so that everyone can benefit.